The Centro Botín is a new space for art, culture and the diverse activities of the Fundación Botín. It is constructed in the Jardines de Pereda, on the seafront of the city of Santander in north-western Spain. The project reclaims an area currently used as a car park, restoring it to the city. 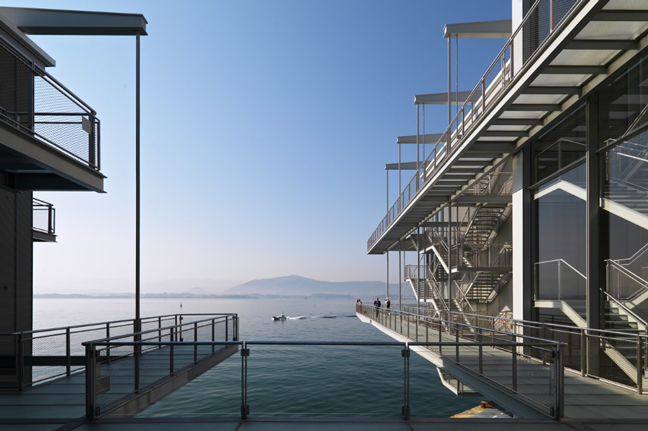 The site, organized as an extension of the city grid through the existing park, provides direct access from the historic town centre to the sea and enhances visual connections with the water. 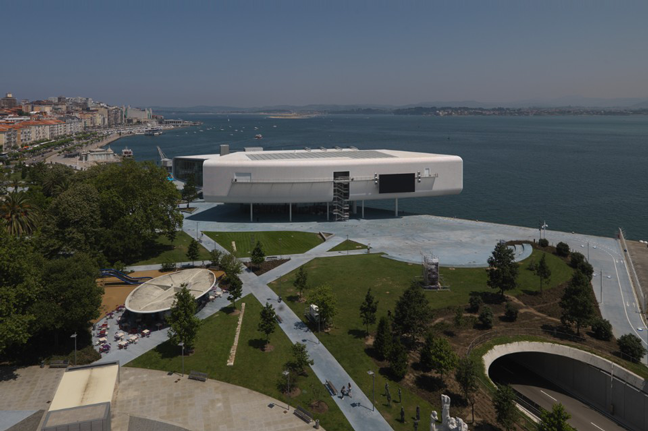 The building is a new landmark on the waterfront, both from a visual and cultural perspective, as well as a mean of boosting the activities of the Botín Foundation. 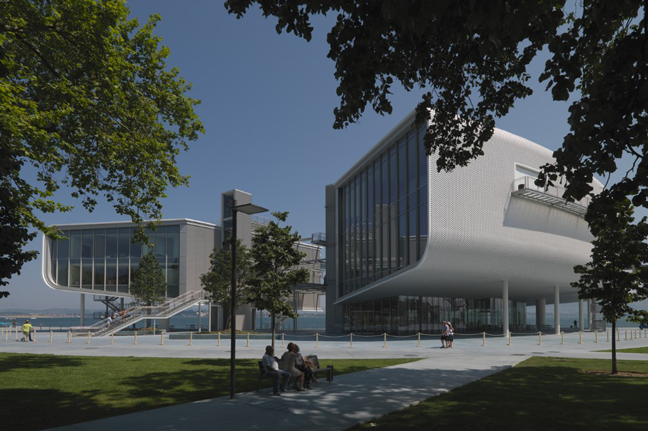 Thanks to the Foundation’s diverse cultural and research programmes, it is expected that the centre drives cultural, social and economic development in Santander. 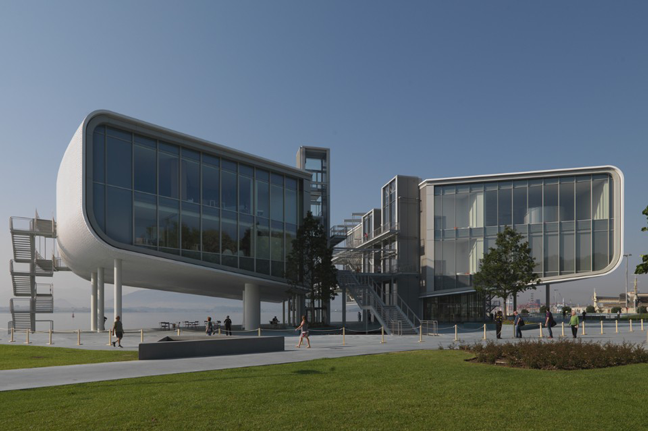 The centre is organized into two parts, a west and an east wing, joined by an elevated walkway that culminates in a platform cantilevered out over the sea. The west wing of the building is an exhibition space: 2,500 sq. meters of 5m-high versatile spaces over two levels providing galleries and support areas. The upper level has a skylight system that allows some of the gallery space to be naturally lit. The smaller east wing focuses on education and accommodates a convertible 7.5m-high auditorium space with 300 removable seats and, on the building’s upper level, a multi-purpose area of approximately 255 sq m. The auditorium has a glazed façade to the south, offering the option to have speakers, actors or musicians performing against the backdrop of the bay with its traffic of ships. Both buildings are raised thanks to supporting columns. 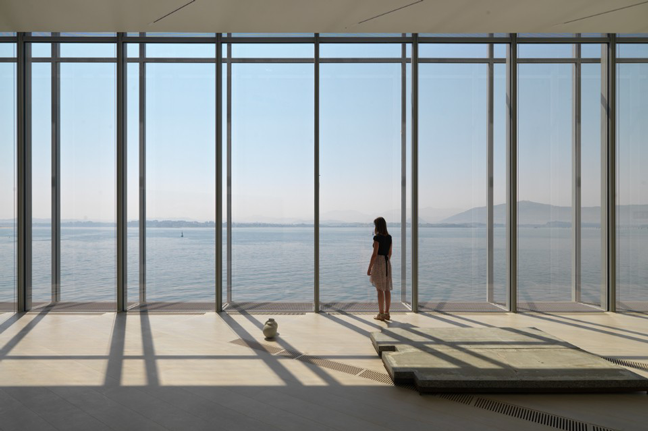 Together with the buildings’ curved shape, this structure lightens the facility’s presence on the site and allows clear views from the park to the sea. The curved edges also draw light and reflections off the water into the space under the building. The exterior are clad with small off-white ceramic tiles that easily adapt to the shape of the building and that also have a shimmering, mother-of-pearl finish, which strengthens the building’s luminosity, under Santander‘s often grey sky.